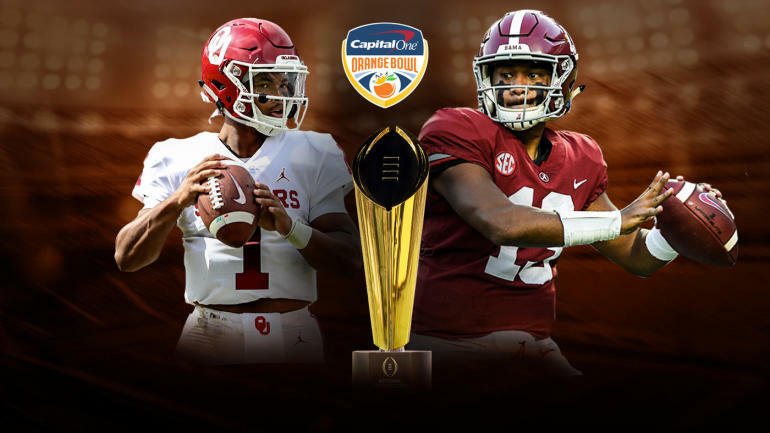 MIAMI GARDENS, Fla. – # 1 Alabama appear to have total control at the halfway point of the Orange Bowl, leading the # 4 Oklahoma 31-10 in the second College Football Playoff semi-final of the day. The Crimson Tide started early with their first three occupations and a dominant defensive start, setting a new Orange Bowl record of 21 in the first quarter. The Sooners had a lot of life in the second quarter and returned with two scoremissions thanks to two giant attacks from CeeDee Lamb and a canny playmaker for Heisman Trophy winner Kyler Murray. 00 percent, but played a flawless first half. The second-starter completed 15 of 17 passes for 224 yards and two touchdowns. Backup QB Jalen Hurts also played several snaps, many in a brand new offensive set, with both quarterbacks lined up in the field with one in the shotgun and the other next to the wide receiver. As a team, Alabama scored an average of 8.2 meters per game, converted 5 of 7 third downs and played only once. If Oklahoma will rush back, Murray will need more, completing only 6 of 13 passes for 122 yards in the first half and doing most of his field work, stopping the team with 46 net yards in nine attempts. CBS Sports will be with you all Saturday and update this story with the latest 2018 Orange Bowl results, analysis and highlights. If you can not view the live updates listed below, please click here.